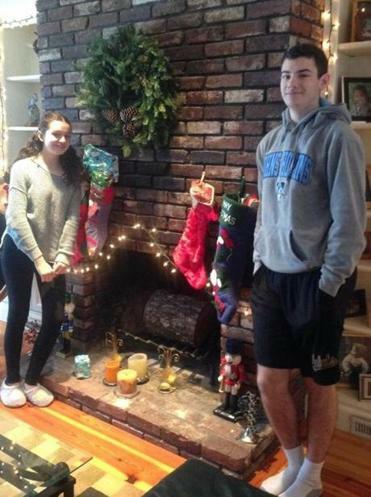 Holly and Tim West helped with the Christmas decorations at author Nancy Shohet West’s home. Hamburgers — made using my mother’s recipe, in which milk, ketchup, eggs, bread crumbs, and spices are mixed into the ground beef — and apple crisp. That’s what my son wanted for dinner on his first night home from college for winter break this month. That’s also what he wanted last year on the first night of winter break. I had envisioned making grander plans: dinner at a special local restaurant, or at least a fancier home-cooked meal. After dinner, I imagined he’d want to go visit high school friends. But this December, just like last December, Tim asked for hamburgers and apple crisp, and once dinner ended he and his sister spent the rest of the evening setting up their favorite Christmas decorations while playing the YouTube satire of “Baby, It’s Cold Outside” — the politically correct version that emphasizes consent in every verse, which they find hilarious year after year — on continuous loop. Watching them repeat the ritual as he returned from the first semester of sophomore year made me think about all that this simple tableau represented. I’m grateful every day for our comfortable lifestyle, but growing up in an affluent community means constant reminders of the luxuries other families enjoy that are beyond our reach. My children are more fortunate than most throughout the world, and we’ve done all we can to make them aware of that. They understand that unlimited food, secure housing, and quality education are luxuries in themselves. Still, there’s always another family going a step further when it comes to providing the next amazing experience. New cars as children turn 16. Ski vacations in St. Moritz. Yearly trips to the Virgin Islands. Lessons and summer camps catering to every interest, from skating to electric guitar to astronomy to parkour. Not that I think children require those things, but I always assumed they benefited from such a multitude of opportunities. How could they not? When my son’s second grade class was studying the Iditarod, I put my journalist skills to work and arranged for him to interview an actual Iditarod competitor by Skype — something I thought was remarkably creative of me until I discovered that three kids in his class were taking family trips to Alaska that summer to trace the Iditarod course for themselves. Yet when my 20-year-old comes home from college these days and all he wants is his favorite home-cooked dinner and time with his sister to decorate the Christmas tree, I see at last the proof I’ve been seeking, irrefutable evidence that if you provide children with a happy, nurturing household, they’ll make their own opportunities. And as I watch my two children fall into their old patterns of teasing, joking, and occasionally confiding as they deck the halls, I realize how little any of my previous uncertainties about how we were raising them matter. Having just finished a productive semester at a college he feels lucky to attend, my son is now safely home. Millions of parents cannot say that: whether because their children are at war, in prison, in a hospital bed, or never coming home. The same week last year that we dropped Tim off at college for the start of freshman orientation, I attended two funerals for teenage boys. One was a classmate of my daughter’s, a 15-year-old who died in a bicycling accident; the other a family friend, a 19-year-old killed while riding his motorcycle. With every simple ritual of moving into the dorm or coming home for vacation that my son goes through now, I think again of those two boys who will not go through the same fundamental growing-up rituals. Years ago I saw a postcard on a friend’s refrigerator door. It was a black-and-white photo of two parents kneeling over a bathtub bathing a baby, and the caption said, “Normalcy is the greatest gift.” Hamburgers and apple crisp: nothing could be more normal. And yet having my child home safe and happy from another semester of college: In its own way, nothing could be more extraordinary.